Being a university student in Ontario comes at a high price. Tuition rates are some of the highest in the country and with the current rent crisis, housing in downtown Toronto is unaffordable for students working at minimum wage. For some, being able to afford the high cost of living in the city while attending university means becoming a sugar baby. According to SeekingArrangement.com, a growing number of Ryerson students are becoming sugar babies to pay for post-secondary education costs. The company’s annual list of “Fastest Growing Sugar Baby Schools” in Canada was released earlier this year. The University of Ottawa was ranked third, Ryerson University came in at second and the University of Alberta topped the list at number 1. Currently, Ryerson has the second highest number of students registered on Seeking Arrangement. 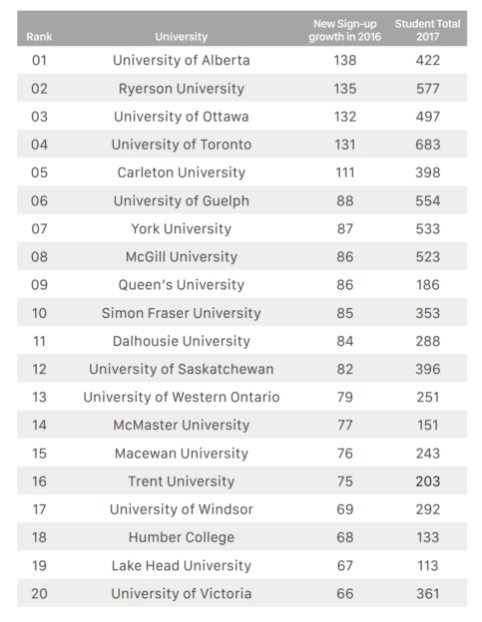 University of Toronto has the most and University of Ottawa is third. Bailey*, a first-year student who was a sugar baby before coming to Ryerson, said she’s not shocked that the university has one of the highest rates. “I’m not necessarily surprised that Ryerson has [one of] the highest student signups because I just think living in Toronto is the most expensive thing,” said Bailey. Bailey was a sugar baby for approximately a year and had three arrangements made during that time. She said she was introduced to the sugar baby lifestyle through a friend and wanted to make enough money in a short amount of time to afford her rent and schooling for her first year of university. When it comes to tuition, the Ryersonian previously reported that Ryerson has one of the lowest overall tuition rates in Ontario, but it’s still higher than other provinces. In addition, tuition isn’t the only thing contributing to Ryerson students’ debt. Susanne Nyaga, the incoming Ryerson Students’ Union (RSU) president, said that it’s a combination of factors that contribute to students finding alternative ways to make money. “Affordable housing is very, very hard to come by. Food costs in the downtown core are at high rates. When we look at tuition, that’s also at a high rate … Everything is at a high rate and not very accessible for somebody who’s coming from a low economic status,” said Nyaga. But if tuition rates decreased, she said that would start to help students combat their debt. “The university needs to look at how to cut tuition costs and make sure students aren’t sacrificing a meal to pay for a class,” said Nyaga. For Amy*, a first-year Ryerson student, being a sugar baby has let her live a life of luxury while being a student. Amy has been a sugar baby on and off for a few years and says she got into it because she was more interested in the lifestyle of being a sugar baby than the money. Nyaga said that Ryerson having one of the highest sugar baby rates may have something to do with its location. “When we’re looking at the high signup [rate] of sugar babies at Ryerson in comparison to other schools, we also need to understand the dynamic[s of it]. “With Toronto being a huge metropolitan [area] … It’s very different than other suburban atmospheres like Guelph or Waterloo or Western,” she said. Bailey agreed, citing the location as a middle ground for these types of arrangements to work successfully. Brooklyn is a Toronto-based journalist with a bachelor degree in journalism from Ryerson University. She is currently a freelance reporter for a variety of news outlets, covering business, tech, lifestyle and entertainment. Her goal is to provide an authentic voice to all her stories and push herself as a journalist each day. She is fascinated by all mediums of news, from print to digital to broadcast, and tries to evolve herself with each outlet. Student debt got you down? Don’t worry, it’ll only take you 20 years to pay it off! So why not be honest about it? Call it what it is, prostitution.